I attended my first Avon KissCon over the weekend. For those of you unfamiliar with this event, KissCon is a fun-filled day with Avon and Harlequin romance authors held in various cities around the U.S. When I discovered this fall's KissCon would be held in Atlanta - an easy drive for me - I knew I had to go and I am so happy I did! Saturday kicked off with morning tea with Eloisa James at Tea Leaves & Thyme in Woodstock, Georgia. What a lovely tea room. The food and tea were delicious and the company couldn't be beat. Terri Osburn and former Disher, Andrea wearing the fun and fabulous fascinators each person attending received. Fashionably dressed Eloisa James arriving for the Tea. And check out her adorable shoes! My friend's wonderful husband dropped her off on his way to the nearby Highland Games and graciously posed for a photo before he left. There's just something about a man in a kilt, am I right, ladies? The KissCon events began at 1:00 Saturday afternoon with a fun Q&A with the authors followed by a book signing. Authors attending were Maya Rodale, Cat Sebastian, Brenda Jackson, Maisey Yates, Beverly Jenkins, Tessa Dare, Jeaniene Frost, and Eloisa James. One of the highlights of the day for me was meeting long-time Dish reader, CherylC! Another highlight was reuniting with original Dishes, Buffie and Andrea. Many hugs were exchanged! Brenda Jackson was signing copies of her new book, Love in Catalina Cove (out later this month). Watch for my review - and a giveaway - next week! Maya Rodale was signing copies of her new Gilded Age historical, Duchess by Design (out today!). After the book signing, those of us who had purchased tickets to the VIP reception meandered across the street to Foxtale Book Shoppe for food, beverages, books, and a chance to visit one-on-one with all of the authors. Beverly Jenkins and I went to the same university and discovered while chatting at the VIP reception that we were on campus at the same time! With the wonderful Eloisa James and my good friend, J. Perry Stone. 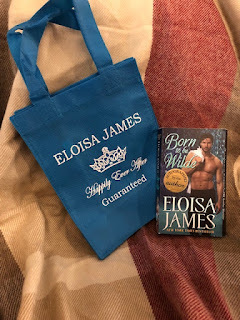 I'm loving Eloisa's new Wildes of Lindow Castle historical romance series! Tessa Dare, Cat Sebastian, and Avon Editor, Erica Tsang. With Eva Moore, whose book, Stripped Down, released yesterday. If you're ever in the area, drop by the Century House for a bowl of Butternut Squash Soup. It's amazing! If you have the opportunity to attend a KissCon event, I enthusiastically recommend it. Next April will be the first full weekend KissCon event in Chicago with 30 Avon and Harlequin authors. I'd love to see you there! Click here for more information about the event. Have you attended any of the KissCon events? Who would you most like to meet at KissCon? Are you going to KissCon Weekend in Chicago next April? I was in raptures over my Butternut Squash Soup. What's your favorite fall food? Did you know Brenda Jackson is one of your local authors? It sounds like you had a nice time. It would be nice to attend KissCon, but it's never within driving distance from where I live. They've been moving it around the country the past couple years. Maybe it will come your way one of these days! It was so wonderful to meet you after talking online all these years, Cheryl! Wonderful photos, great food and fun. What a delight.I have never attended this event but it looks special. My favorite fall food is Hot Chai with a pumpkin scone. She is the nicest, most genuine person and really cares about her readers! Please let me know if you decide to attend KissCon Chicago. I'd love to meet you! I would enjoy this experience and especially meeting authors whose books are wonderful. Eloisa James is one whose novels I enjoy and would love to meet. A food during fall which I look forward to is roasted yams. Roasted veggies are my go-to comfort food all year but I especially love the fall squash family! Eloisa James is a lovely, genuine, caring woman...as well as being a terrific author. I hope you have the opportunity to meet her one day. I've never been but would love to attend a Kiss Con! The Atlanta one would have been ideal if the timing wasn't so horrible for me. 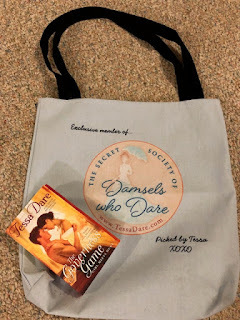 The top 2 authors I'd want to meet Re Eloise James and Tessa Dare. I adore their books! Oh and fall food? I don't have a favorite , but I love that it is cool enough to make stews and SOS on a regular basis. It was so great to see you again. I pre-ordered Wishing on a Star. Looking forward to reading it in December! I attended the Kansas City KissCon in March 2018. The authors were Jodi Thomas, Lori Foster, Jill Shalvis and more! It was awesome!! A good friend of mine went to KissCon KC and had a blast. I love that they keep changing up the authors to keep it fresh. I have not attended a Kiss Con event and doubt that I would be able to attend the one in Chicago. But I do hope to attend one someday. As to what author I would most like to meet there, that is a remarkably tough question. Two of them are people you met at this Kiss Con, Tessa Dare and Eloise James. And in my further list would be Alisha Rai, Jennifer Estep, Lorraine Heath, Sarah MacLean and Julia Quinn. And that is just really part of a long list! Favorite foods are Pumpkin bread, apple anything. Loved the event, the authors, the company I kept, and the squash soup! Have never had the joy of being at a Kiss Con. Not in my future, so , please continue to share the fun with us. I like all fall food - shoot fire - I like food from all the other seasons too. Thanks for letting us enjoy your visit. I have not attend a Kiss Con and I won't be able to attend the one in April. I was thinking if it were at the end of the month, I would travel to Chicago for my 60th birthday. But alas, it is the weekend that our cousin is getting married and plans have been made. I would dearly love to meet Beverly Jenkins and Brenda Jackson. A friend game me a couple of their books and have loved reading them since. Favorite fall food is home made vegetable soup. It is my Mom's recipe that she passed down. I went to a KissCon in Baltimore a few years ago. I haven't been to KissCon yet & doubt I'll get to the one in Chicago (unless I win the Megamillions tonite - LOL). I love the apple cider donuts that many of the farm stands do this time of year. I've yet to attend a KissCon but would love to attend the one in Chicago. I'm guessing that will be the closest to me in Minnesota. Thanks for letting me know about this. Looks like you had a great time; thanks for sharing. I drooled at that soup photo! My favorite fall food (unless we’re counting leftover chocolate Halloween candy) is sweet potato casserole. I've never been to a Kisscon event. If I ever did go to one, then I would love to meet Shana Galen or Jennifer Ashley. I really don't have a favorite fall food. How FUN! I haven’t attended an KissCon yet. I wished they’d come down to FL, so all my friends could attend, too! I can tell you had a fabulous time! Don’t enter me in the giveaway, I’m just excited for you❤️ Smiles! It looks like you had a wonderful time at KissCon. I am glad you got to meet up with friends and make new ones. I hadn't heard much about KissCon. Atlanta isn't that far from us, but we were at a wedding in Northern NY this past weekend, so I couldn't have gone anyway. I signed up for the notifications about it. Will have to see if I can go then. I was able to go to RT in Dallas a few years ago and really enjoyed it. Hard to decide who I would like to meet. There are so many I have enjoyed. Linda Lael Miller is one I and Lindsay McKenna another. Butternut squash is a favorite. I have done soup, roasted, added to stews & vegetable soups, and plain with butter, salt & pepper. I look forward to the colder months because I enjoy making stews and doing roasts. Thank you for your pictures PJ. It looks like you had a great time. I've never been to a KissCon event but would love to go if they ever come near my town. I'd love to meet Eloisa James, Karen White and Jennifer Ashley to name a few. Fall reminds me of beef stew& corn bread. Thanks for sharing the photos. I have never attended any romance book convention. Would love to at some point. Those desserts look great. As I do not read historical books, please do not count me in for the drawing. Some lucky lady who does will really appreciate winning. Terri, you need to get on that roster!! !